If you have an iOS device and you really want to independently test the aquatic features that are not yet available for your operating system, the addon makers are always trying to help people like you. 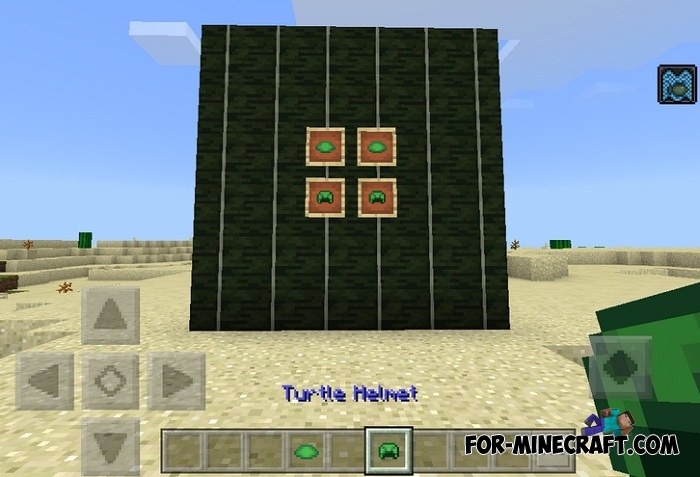 Turtle Helmet addon replaces the gold helmet with turtle one, so you can try a new type of armor that is added to Minecraft BE 1.5.0.7. To get this new helmet in beta versions you need to find and kill a turtle and then make a shell out of scutes. The turtles themselves are peaceful enough and do not resist if you hit them. Important: By installing this addon you will not get turtles, only two new items: a turtle shell and scute. But you may have seen huge Animals addon adding a lot of animals to MCPE, follow the link and enjoy the new animal. How to install the Turtle Shell addon?